The lobby. It’s not the first thing you think about when choosing a managed office space in London but it is the first thing that you, and more importantly your visitors, will see. So it is no surprise that many London offices go beyond the functional to something more impressive when it comes to lobby design. It is after all about making the right first impression and setting the tone with a space that is in line with a company’s brand image and values. 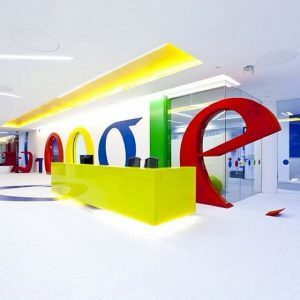 Big companies like Google have always got this right; the lobby of its former offices on Buckingham Palace Road were adorned with a giant Google logo; visitors could step through either of the two ‘o’s which formed doors to the rest of the building. Beyond being a quirky gimmick, it was a symbol of how the company serves as a portal to the web. But image-enhancing lobbies aren’t just for the likes of Google. 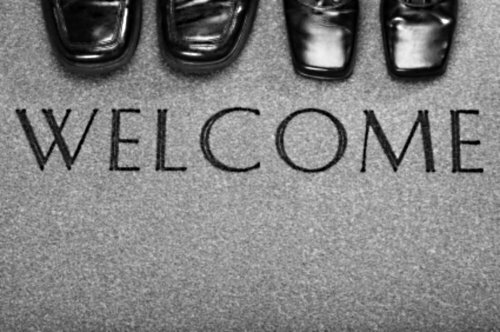 Providers of managed office space in London are well aware of their tenants’ need to create the right first impression. Therefore even those business centres operating within a large, multi-tenant building take the image of their lobby in to account. 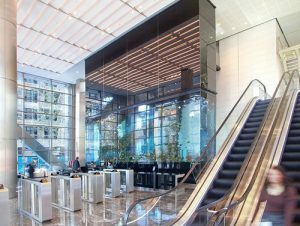 Take Heron Tower: this managed office space in London provides space for a variety of businesses, all of which benefit from the prestige of the building. Its lobby area is home to Europe’s largest aquarium, packed with 1,200 fish in 70,000 litres of water. The display is quirky, unexpected, and guaranteed to make visitors stop and gaze for a minute or too. 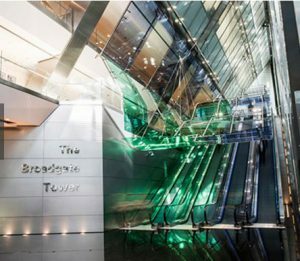 Over at Broadgate Tower, the lobby acts as a continuation of the building’s impressive glass exterior; an elaborate construction of glass escalators are lit up in different colours. The effect is a striking, elevating a purely functional space with minimal furnishings into a showpiece. Countless other managed office spaces in London feature impressive atriums. They fill the lobby with light and provide a spectacular view of the full height of the building. And then there are the hidden treasures; a Formula 1 car showcased in the lobby of this managed office space in London City, or a period wrought-iron staircase in Covent Garden. From the quirky to the high-powered, managed office space in London caters for every sort of first impression a business could want to create. Is it time to set the scene? Explore a hand-picked selection of London’s most exclusive offices at LondonOffices.com.